Living with anxiety is hard and people who don’t experience chronic anxiety have a hard time understanding what you are actually going through. Anxiety is something that I have dealt with on and off for years. Some days it is better than others. And while I’ve never been formally diagnosed, it is definitely something that I have sought help for in the past. The way people experience anxiety can be very different. My anxiety comes in the form of worrying about little things. It comes in the form of obsession about things that might cause harm to my body such as germs or chemicals or diseases and what not. It sometimes expresses itself in anger towards people who don’t deserve it, but if I am worrying anxiously about something, and then discussing something completely un related with someone it can cause me to take my anxiety frustrations out on them. With my various anxieties, I sometimes have to do things a few times to make sure in my own head that the are actually done, or that my health will not be harmed, even by something as simple as using a public washroom (this is where the OCD component comes in). Most of my anxieties are completely irrational and I have taught myself to acknowledge my feelings but to move past them through the power of my mind and exercises in mindfulness.These exercises where given to me by a therapist and have helped me combat my daily anxieties. Anxiety is a qualification of dreaming spirit, and as such it has its place in psychology. Awake, the difference between myself and my other is posited; sleeping, it is suspended; dreaming, it is an intimated nothing. The actuality of the spirit constantly shows itself as a form that tempts its possibility but disappears as soon as it seeks to grasp for it, and it is a nothing that can only bring anxiety. More it cannot do as long as it merely shows itself. [Anxiety] is altogether different from fear and similar concepts that refer to something definite, whereas anxiety is freedom’s actuality as the possibility of possibility. Anxiety may be compared with dizziness. He whose eye happens to look down the yawning abyss becomes dizzy. But what is the reason for this? It is just as much in his own eye as in the abyss, for suppose he had not looked down. 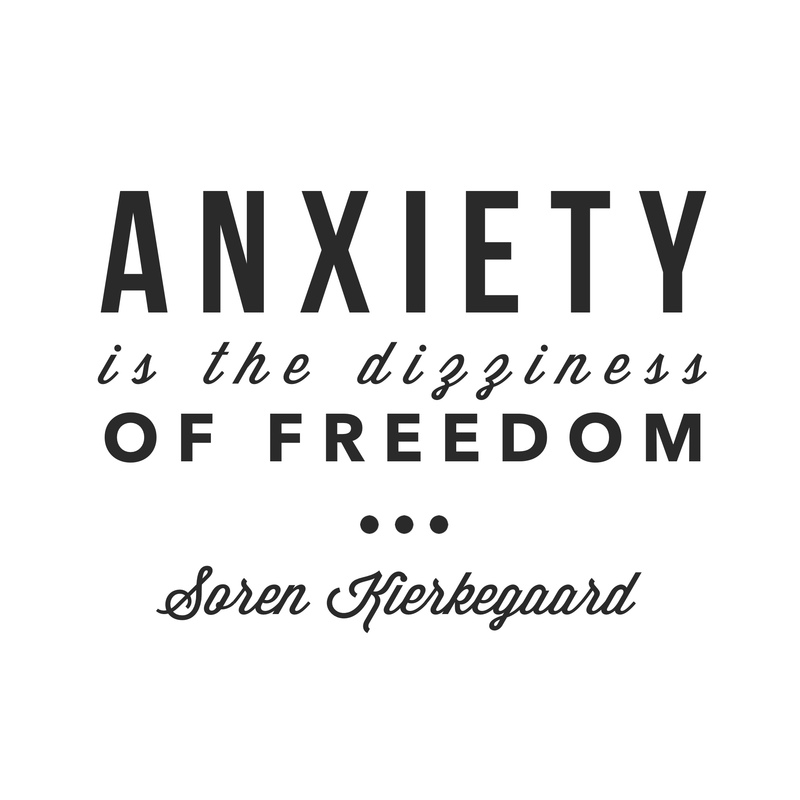 Hence, anxiety is the dizziness of freedom, which emerges when the spirit wants to posit the synthesis and freedom looks down into its own possibility, laying hold of finiteness to support itself. Freedom succumbs to dizziness. Further than this, psychology cannot and will not go. In that very moment everything is changed, and freedom, when it again rises, sees that it is guilty. Between these two moments lies the leap, which no science has explained and which no science can explain. He who becomes guilty in anxiety becomes as ambiguously guilty as it is possible to become. I know that as soon as I get in a negative tail-spin it’s only down, down, down from there we go. My negative thoughts only breed negative thoughts. Many things can set off the rampage of negativity such as a fight with my partner, something stressful happening at work, traffic, or just having a plain old bad day. But, when those things do happen, I want to have a way to combat them and not to get into such a downer mode or an anxiety ridden state that can be hard to get out of. I’m not saying that my thoughts are all roses and butterflies but I definitely know I can get caught up in negative emotions, because life goes on and it is much better when I am looking to the bright side of things. For me, I know that light and smell really affect my mood. Life is stressful no matter who you are, and I really try to take a few minutes each day to chill. For me, this may mean having a cup of tea with a candle lit and watching a favourite TV show or using essential oils to boost my mood. I find, if I take some time to indulge in these things it has a drastic impact on my mood. I am less likely to let some anxieties bother me and even after a stressful day it can really help to calm myself and help me not to be so snappy. I’ve noticed my mood and how I handle stress drastically improves when I am hydrated. This is something that is quite simple but I know I often don’t get enough water each day. When I drink more water I’ve noticed that I get less headaches and I am a generally more happy person. Seems like a no-brainer, right? This is something that I have used more in the past to help with anxiety. I do find that getting outside still really helps to clear my thoughts and to calm me down. Something about fresh air and time to clear your head that is so important for well being. I find when I talk about the feelings I am having with people who understand it truly helps to combat my irrational anxieties. This could be a good friend (I use this one a lot, sorry guys!) or it could be a therapist or counsellor. It is really important to have a support system and to not internalize your feelings. Some days all it takes is for a good friend to say “calm down, you are letting your thoughts get the better of you, don’t worry!” I think if I didn’t have some sort of support system, I would be in a really dark place. For me this is going to a group fitness class, at least once a week. But doing something active can really help to get the good feelings flowing. Even yoga is a great exercise and one that I need to try to do more often as it combines physical well being with mental well being. I find I need to get out of the city every once in a while. Doing a weekend day trip to the mountains or visiting a friend in another city can really help me to re-charge and give me a new perspective. If I make sure that my diet is in check I always notice that I am in a much better head space. Not only eating healthy food but making sure to eat something at breakfast, lunch and dinner and to stop for snacks in between. I find planning all of this difficult some days but when I do, I feel much better. I think that mental health is a societal issue and it is important to talk about how we are feeling. If you have serious feelings of anxiety it is a great idea to seek a mental health professional to give you the tools to deal with it. I am always looking for more great ideas to combat my anxious feelings day to day. Please share your strategies with me! I love sharing common stories and I think it is so important to speak and to listen.